The Hannover-based tyre manufacturing company Continental AG, with a history of more than 100 years, has become one of the world's five leading TIER-1 suppliers by now. The importance of the Group in the automotive industry is clearly demonstrated by the fact that it played a key role in the development of the technology of hybrid-powered systems in 1997. Listed on the Frankfurt Stock Exchange, Continental realised more than EUR 40 billion in sales in 2016, employing more than 233,000 employees in 56 countries. Continental started to establish its concerns in Hungary in 1991. Currently, they have 5 divisions, 6 companies and 7 operating sites in Hungary. The German top supplier is engaged in manufacturing activities in Makó, Nyíregyháza, Szeged and Veszprém, where they already have an R&D centre since 2003. 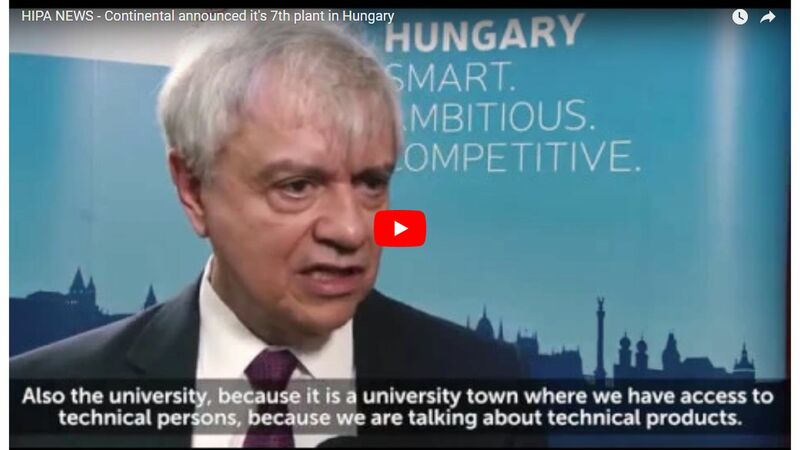 Employing about 8,000 employees, the company constantly develops its units in Hungary with high-tech manufacturing and R&D: the Deep Machine Learning Competence Center in Budapest announced last month is a perfect example of this progress. With this project, Debrecen is the seventh Hungarian city to join the Continental group, after a long and hard regional competition to win this project. The investment – based on the growing demand for automotive electronics – starts in Q3 2018, production is planned to be launched from Q3 2020. Products of Continental's Transmission and Sensors & Actuators business units are the first to be manufactured on a production site of 7,000 square meters and assigned to EU markets. - explained José Avila, Member of the Executive Board of Continental and Head of the Powertrain division. - added Róbert Ésik, President of HIPA.